Bridal bouquets can come in a variety of sizes and flowers, but before you order anything you’ll need to know more than just your colour scheme. Here’s some great questions to ask your florist to make sure your getting the best bouquet for your wedding. 1) Tell the florist about your flower budget and ask her what size can she do for that amount of money. See if they have a portfolio of their work to show you, and ask which bouquet would fall within your budget. Looking at examples of their work will also give you an idea whether their style matches yours, if not you can always look somewhere else. 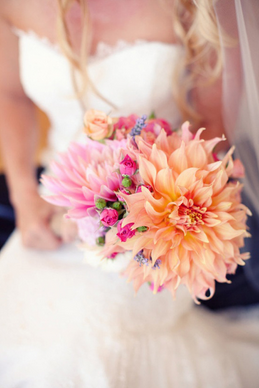 2) Next ask what flowers are available for the season your wedding falls on. This will also give you a more solid idea of what different types of flowers you will be using in your bouquet. 3) Ask how long the florist has been making bouquets for weddings and to describe her style. Experience is key in getting a fabulous looking bouquet, and the florist’s style will also inform you if you would be working with the right person for the job. 4) Ask about your wedding date and the florists ability to deliver the flowers to the different venues. You don’t want an already overbooked florist. Ask about their staff and how many designers they have on hand and how the flowers will be delivered or if they need to be picked up. Knowing these factors will let you know if they can handle multiple weddings. 5) Lastly, ask about payment and logistics. If the florist will deliver ask them about how the flowers will be delivered and what time should you expect them. Also ask if they will set up the flowers and speak with your different venues to ensure set up and delivery. Knowing the ins and outs of your flower needs will give you a better idea about how much money and time will be involved. It will also help you to relax on your wedding day, knowing that all of those details are in the hands of professionals.